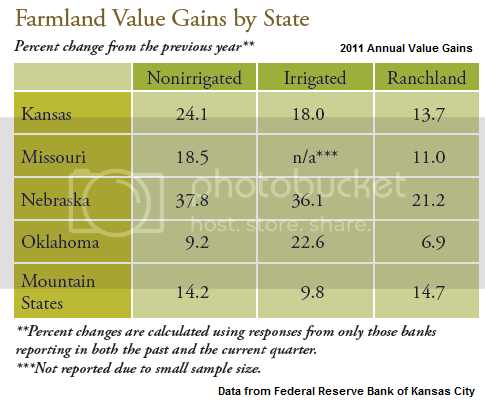 The Federal Reserve Banks of Kansas City and Chicago have come out with their 4th Quarter 2011 farmland price/credit conditions reports. It is always interesting to see how much farmland prices have changed in these reports, especially at year's end. 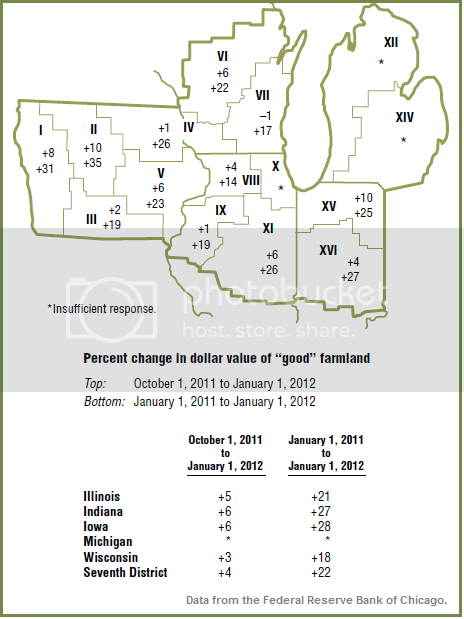 2011 was another stellar year in farmland price gains. It is reported that more absentee and elderly landowners were motivated to sell given these very high prices. Credit conditions remain healthy with cash from high commodity prices being used to make many of the necessary farm expense purchases. The Chicago District reported the highest average gain in farmland prices since 1976, up a 19% inflation adjusted average for the year. Corn, soybean, and wheat prices averaged 57 percent, 26 percent, and 45 percent, respectively, higher in 2011 than in 2010. Milk, hog, and beef cattle prices rose 23 percent, 21 percent, and 21 percent, respectively, although producers faced costlier feed as well. Net farm income in 2011 was up 24% over the previous year. For 2012, the USDA is predicting an 8.2% reduction in net farm income. The three states across these two regions showing the largest gains for the year were Nebraska (up 37.8%), Iowa (up 28%), and Indiana (up 27%). Farmers continue to be the main buyers of farmland in these two districts. Many cash rents were negotiated up steeply for 2012, up 18% in the Kansas City district, compared to 6% higher the year before.